Mr. Friend has been professionally involved in the computer industry for better than 30 years, and has held positions touching on almost all of the technical aspects of computing. He currently is engaged in UNIX systems management, analysis, and programming; previous situations include field engineering and systems maintenance. He is equally "at home" performing tasks relating to both hardware and software and, in fact, tends not to make significant distinctions between them. His original background, based in computer theory is, in the main, self taught although he holds a certificate in "Computer Technology" from Control Data Institute granted in 1980 and several assorted pieces of paper from various corporate training sessions. He is an acknowledged expert in the field of systems and network configuration and management and specialises in multi- platform interoperability. Mr. Friend is fluent in several programming languages, including: C, ALGOL, FORTRAN, BASIC, UNIX shell scripting, Perl, and numerous assemblers. COBOL is available under duress. At various points in time he's also been responsible for programming in APL, SNOBOL, PILOT, and PL/1, although he's forgotten the details. Various operating systems he has supported include: UNIX (AIX, BSD, CLIX, HP/UX, IRIX, Linux, Solaris/SunOS, and ULTRIX), VAX/VMS, TOPS-10, RDOS, RT-11, RSTS/E, and RSX-11M. He is also an acknowledged expert in networking and storage technologies (NAS and SAN). Mr. Friend is also an avid collector of "antique" computers and maintains a collection of functional minicomputers and other assorted devices. He fondly terms this his "museum". He currently serves on the board of directors of The Retro- Computing Society of Rhode Island, Inc. A reasonably up-to-date version of my resume/CV is available on-line. Copyright © 1996 - 2014, Carl R. Friend. All rights reserved. 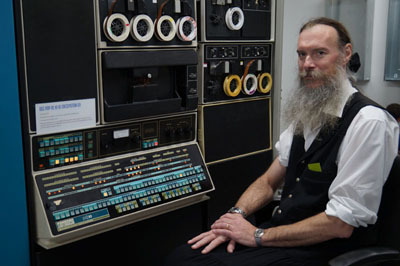 The image is courtesy of, and by permission of, the Living Computer Museum in Seattle where it was taken in April, 2013.